An old adage in woodworking is “you can never have too many clamps”. I would agree, but I would slightly change it to “you can never have too many clamps that are out of the way and easy to reach”. Okay, maybe that one isn’t going to catch on, but this Wall Clamp Storage Rack will keep all your clamps out of the way and easy to reach! And it is dead simple and can be made in a couple hours max. If you are looking to store larger clamps check out my Space Savings Parallel Clamp Rack. In the past I have kept my clamps in drawers, overhead, below tables and of course scattered across the shop. But I always had a few hear and few there. So I’d be searching in several different places before I could find the clamps I needed. 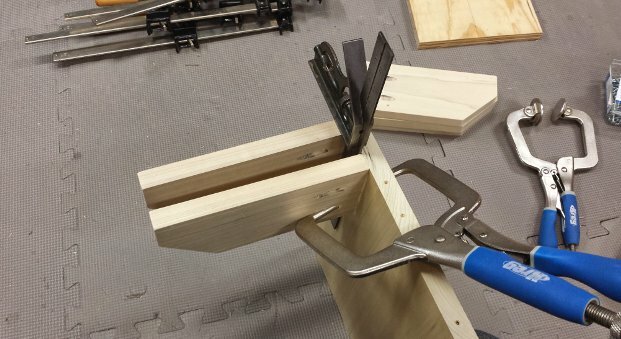 I had enough clamps, they just weren’t in the right place! 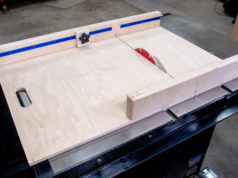 I have some decent storage for my large clamps, but the small clamps are the drifters in my shop. They are hard to track down and even harder to keep in one place…sounds like my kids. 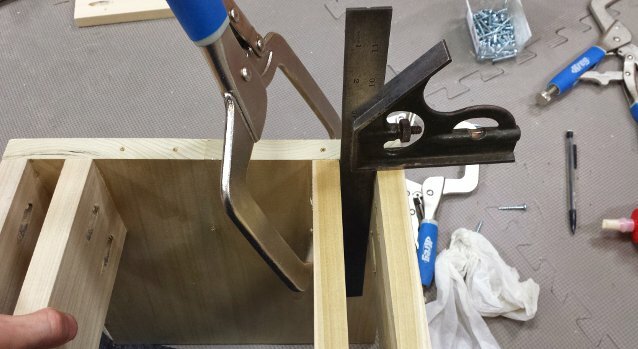 I have several 6″ and 12″ F-clamps and a pair each of the Kreg Face Clamp and Right Angle Clamp. Doesn’t sound like much, but when piled together it’s a hot mess. If you follow me on Instagram or Facebook (if you don’t then why not do it now!) then you know I love picking up scrap wood and cut offs from local wood and mill shops. So I have a TON of scrap pieces of different high quality woods. 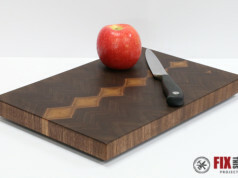 I decided to use some of the poplar I had laying around I had used to prototype some other projects. 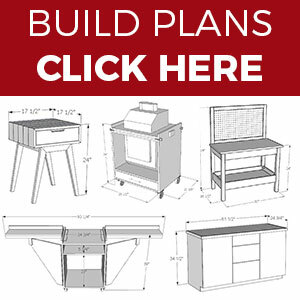 You could use plywood and/or pine for this as good alternatives. 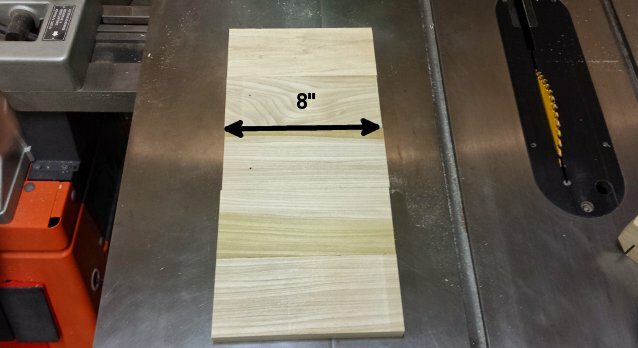 Here are the boards I started with, they are all 3/4″ thick. 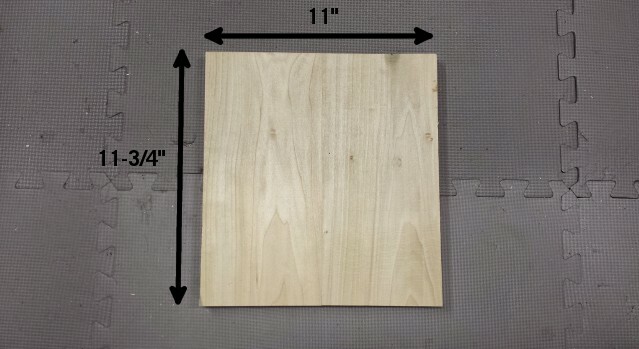 The wide boards were 6-1/2″ and the other boards were 3-1/2″ or the size of a standard 1×4. 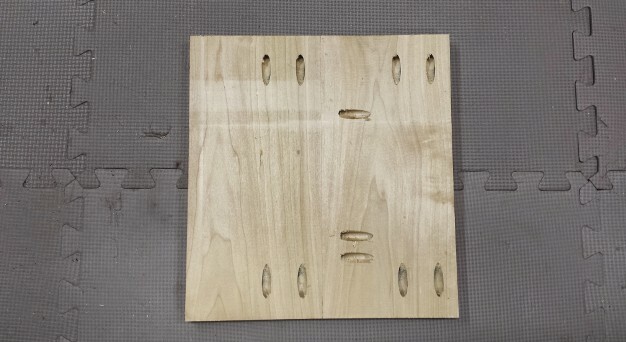 After securing the boards together with 1-1/4″ pocket screws I was left with a backer board that was 11-3/4″ tall and 11″ wide. This will be mounted on my french cleat system, thus the extra length. 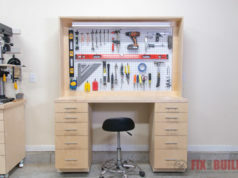 If you will be screwing into the wall then you could make it whatever height you want as long as it’s more than 3-1/2″. Next I cut the pieces to size that will hold the clamps. 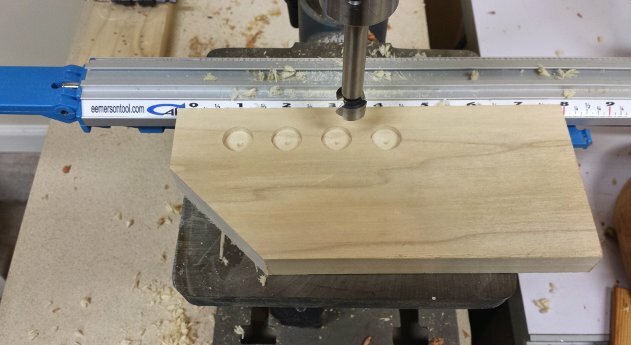 I cut the 5 pieces down to 8″, which was enough to hold all my clamps with a little room for expansion. 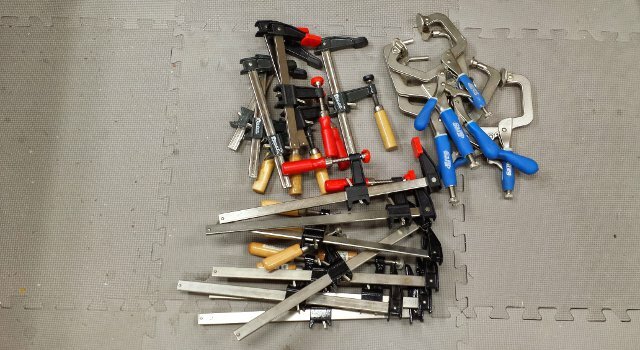 Figure 1″ for every F-clamp you want to hold. 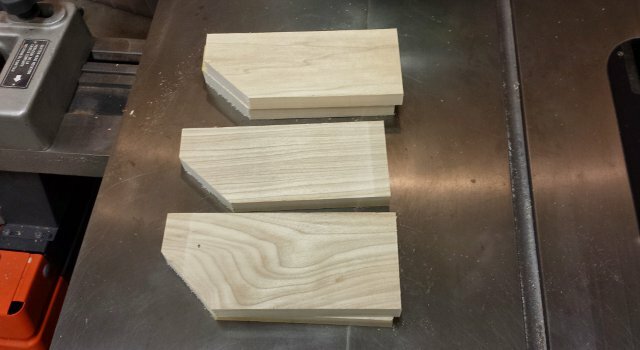 I wanted to lighten up the look of the supporting pieces so I cut a 45 degree miter at the end of each piece. 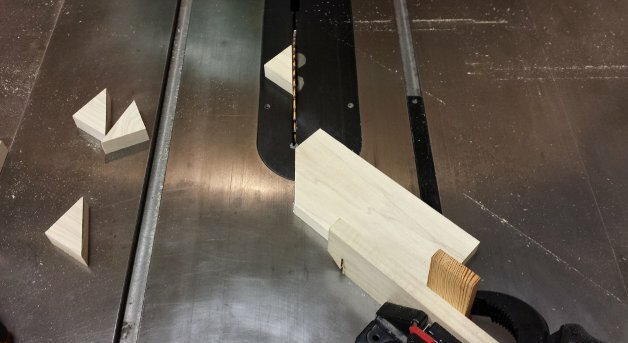 Use a stop block on your miter saw or table saw to get repetitive accurate cuts. After finishing these cuts I sanded all the edges to remove tear out and soften the sharp corners. 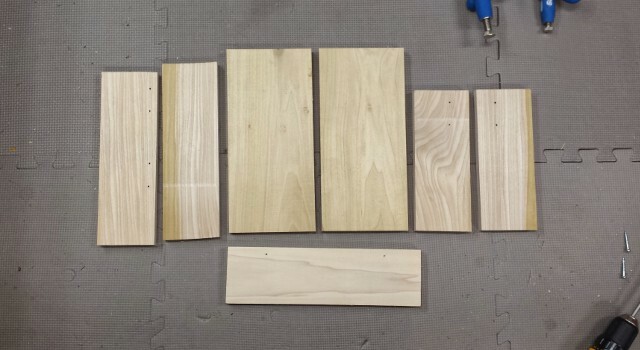 Then I had my 5 pieces ready for joinery. The Kreg clamps are held on the Wall Clamp Storage Rack by locking them down on the middle piece. 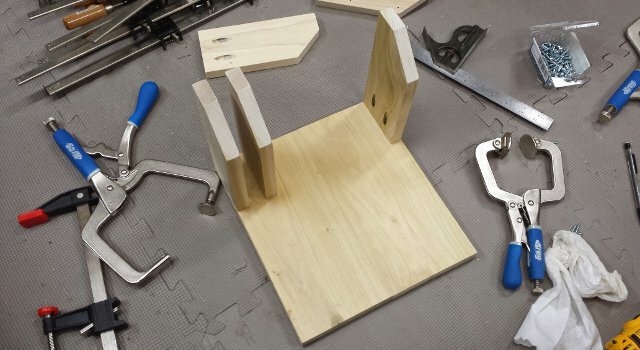 To make it easier to register the Right Angle clamps I drilled a series of 1/2″ holes on the right side of the center support. The metal bar on the clamp that goes into the pocket holes sits in these shallow holes to secure them better. After that it was time for assembly. I drilled 2 pocket holes on the inside of each support. 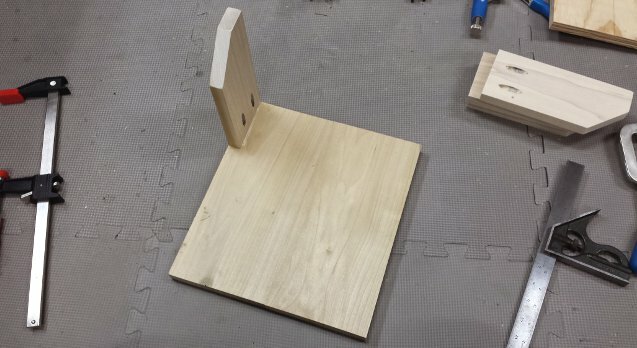 I started off by attaching the left outside support using 1-1/4″ pocket holes and some glue. I spaced the second support 1″ away from the outer support. This gives enough space for my F-clamps to easily slide in and out. Using a combination square will give you just the right spacing. Also the Kreg Right Angle clamp works great for securing these pieces. Next I secured the outer right piece. Definitely attach the outer pieces first or your won’t be able to face the pocket holes to the inside. And look at those clamps, they are already getting out of hand again! Repeat the same process as before to finish off the right F-clamp storage. I centered and attached the middle support and that finishes the main assembly. I hung my Wall Clamp Storage Rack with french cleats as I mentioned before. I put a 2-1/2″ cleat on the top and a 1″ spacer on the bottom as the bottom of the rack will be just shy of the next cleat on the wall. It’s that simple! The whole thing only took me an hour or so to make. 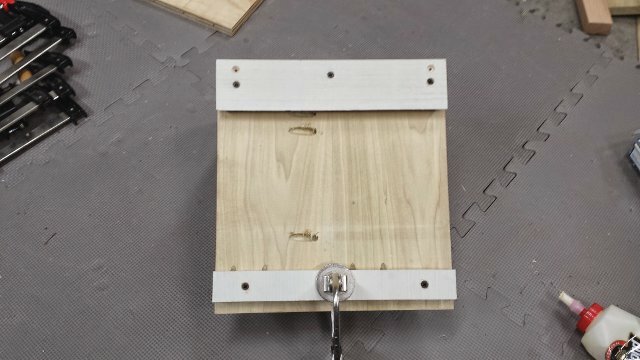 The concept can be modified to hold a variety of different clamps like C-clamps (though I have another solution for those later), spring clamps, parallel clamps, etc. 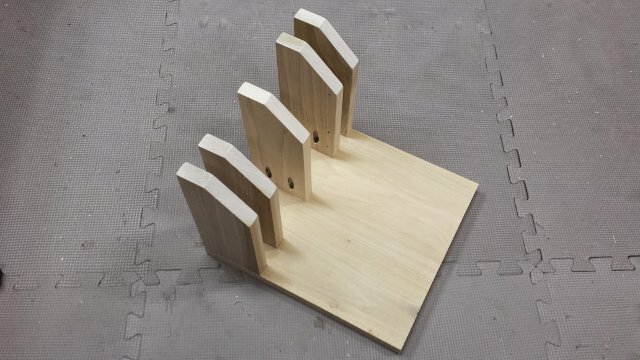 Make it fit your needs and wrangle your stable of clamps with a Wall Clamp Storage Rack!